Many of our participants in the InterExchange Work & Travel USA program have the opportunity to travel across the United States visiting museums, galleries and historical landmarks. 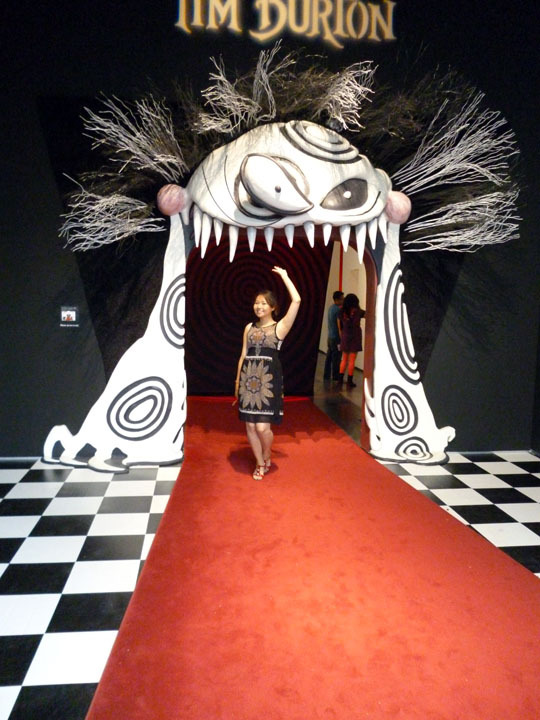 One of our students from the Summer 2011 program submitted this photo of her visit to the Los Angeles County Museum of Art (LACMA), which featured an enormous exhibit of Tim Burton's work. Although Tim Burton might not be a well-known name outside the United States, many of you might know some of his famously quirky American films such as Beetlejuice, Edward Scissorhands, The Nightmare Before Christmas, Corpse Bride and Pee-wee's Big Adventure. Besides directing unique films with often-dark themes, he also produced famous action movies such as Batman, Batman Returns and Planet of the Apes. He is also known for putting a twist on classic stories like Charlie and the Chocolate Factory, Sleepy Hollow, James and the Giant Peach and Burton's latest film, Alice in Wonderland, which starred Johnny Depp. Burton started making short films as a child and was offered an animator apprenticeship with Walt Disney Animation Studios. He eventually broke off to pursue solo works that emphasize his personal style.